The Spanish property market grew an annualised 7pc in August, the first increase since February 2011. 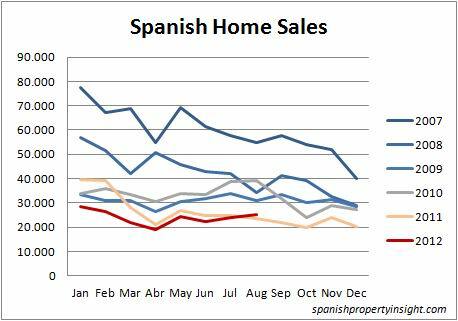 There were 25,020 Spanish home sales in August (excluding social housing), up 7pc over the same month last year, and 4pc on the previous month. The rise came entirely from the sale of new homes, which responded to temporary Government measures to stimulate the market, including a 50pc reduction in VAT (from 8pc to 4pc), effective until the end of the year, when it rises to a new rate of 10pc. Increasing numbers of foreign buyers lured in by lower prices on new homes sold by banks also helped. In contrast, resale transactions fell. The temporary nature of the measures means that home sales might slump again when the measures expire. Some Spanish media have reported the news as the beginnings of a housing-market recovery, which I don’t think it does. However, I do see it as further evidence that the market has found a floor. My guess is the market will stay near this floor for the time being. You can see all the latest transaction figures in the following table (click to enlarge). It looks more like seasonal considering 2009 and 2010. Well that’s a relief, sales booming again today Majorca tomorrow the Costa Blanca. There are lies, big lies, downright absolutely outrageous lies and statistics. That’s good to here Mark, there is a lot of conflicting information about property marketing in Europe, thank you.